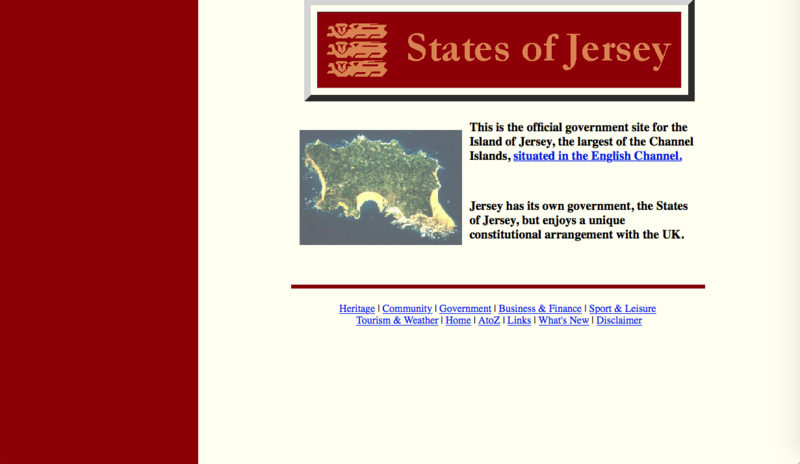 Not that we need an excuse for cake but this week is the 21st anniversary of the Gov.je website. So we’re pulling out the photo album and looking back at how we’ve changed over the years. This statement might have seemed radical back then, but it has certainly proved to be the case, and the impact of the Internet on our lives continues to increase. 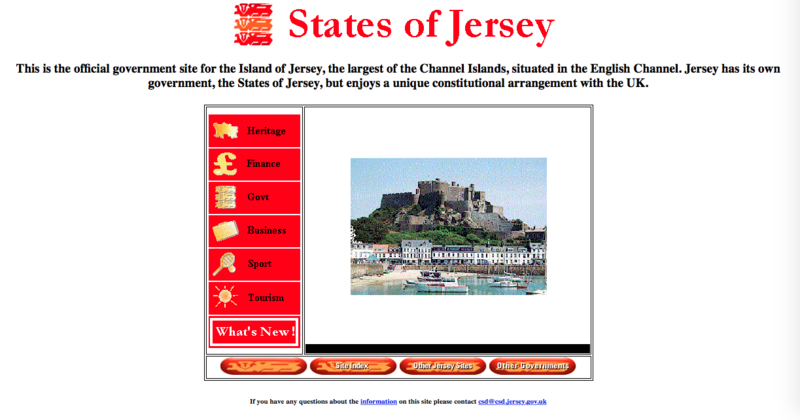 It would be another few years before Jersey Tourism, Jersey Heritage and Jersey Finance would have their own website. This was in the days before web designers paid much attention to font choice. There was no search either, but then we only had a few hundred pages and few thousand visits a month. 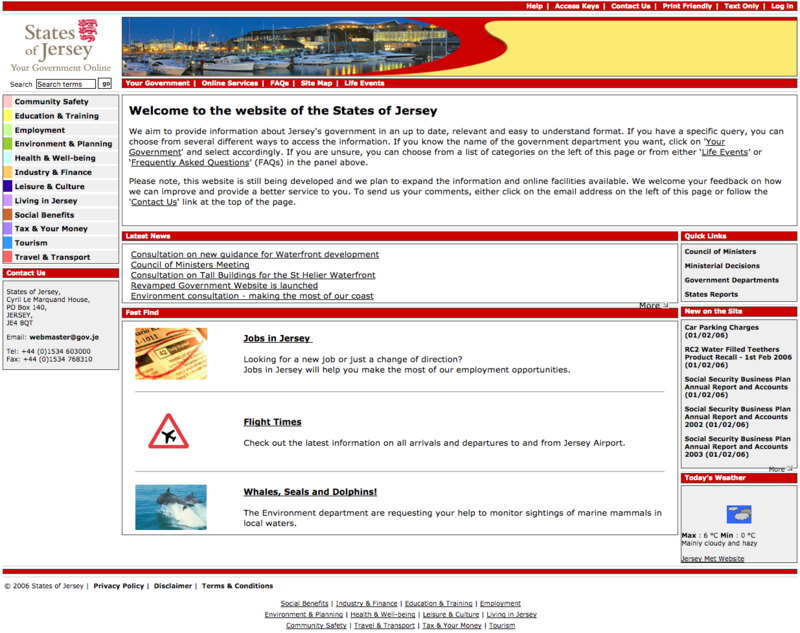 Before the days of branding guidelines, the site took on another look with another colour scheme. The most important information for us to communicate back then was where the Island is. We didn’t have a Google map for Jersey then. Our internet strategy had a prominent place on the home page, as did the millennium bug. 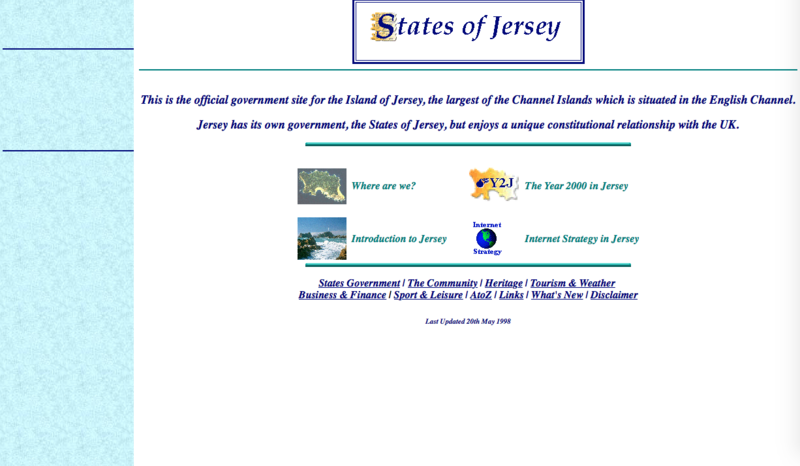 In 2001 another look and another colour scheme but at least this time we were using ‘States red’ and the gov.je domain name. The site also became a gateway for the other sites that the States were now developing. 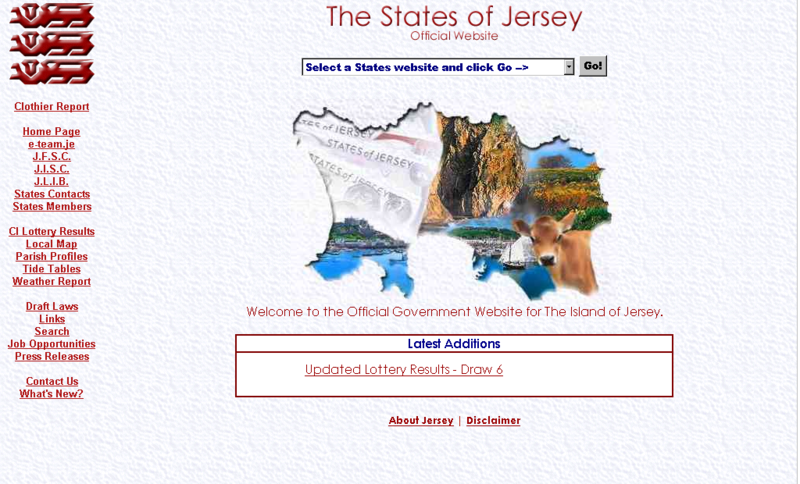 Note the prominence of the Channel Islands Lottery results. This has always been a popular page and remains our most visited page at Christmas. After four years it was time for another redesign. For this one we added a weather widget. We didn’t however realise how popular the weather was on the homepage until we removed it in 2010. This is when we really upped our game. We had 350 web editors across all the departments creating lots of content, 20,000+ pages, with not much consistency. At this point we engaged with a designer, purchased a new content management system, thought about accessibility and used the ‘Integrated Public Sector Vocabulary’ to categorise our content. 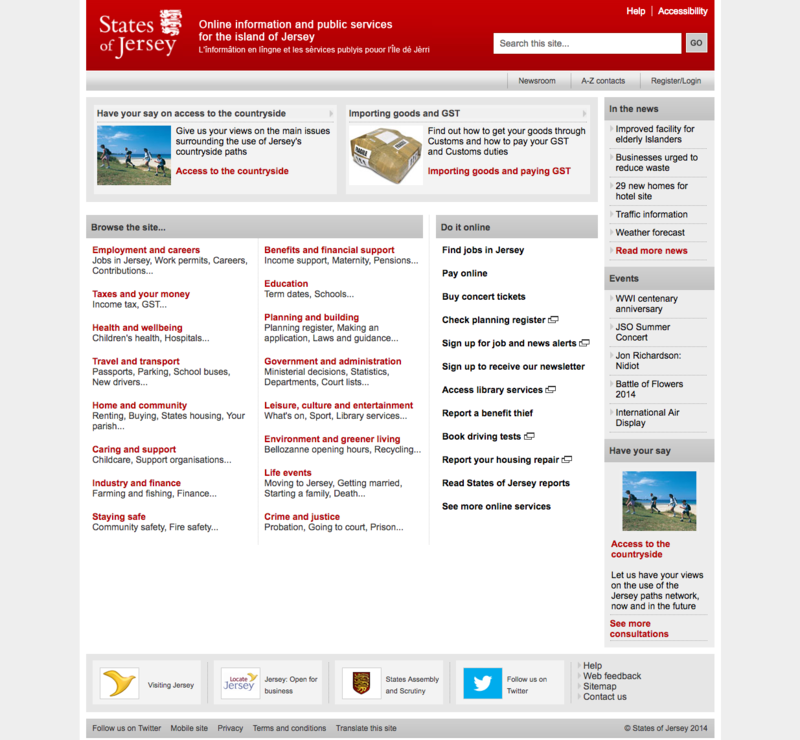 The left hand navigation gives the impression the site was by category but it wasn’t – it was still organised by department. 2010 was when we moved away from the department structure and used customer-focused task based categories instead. We cut down our web editors to 30 and trained them in writing for web. A great deal more information about best practice in the design of public-sector websites was available, and this was reflected in this redesign. It was the first time we used card-sorting and engaged with our actual customers rather than relying on gut feel and hearsay. We made minor improvements to the look and feel of the site based on feedback we had when testing. This is the year that we adopted a ‘responsive’ design meaning that the increasing number of smartphone and tablet users could read the content without having to pinch the screen to read it on their touch screens. With input from seven local companies, we spent days in usability labs testing with real users in order to deliver a site that was easy to use and navigate. 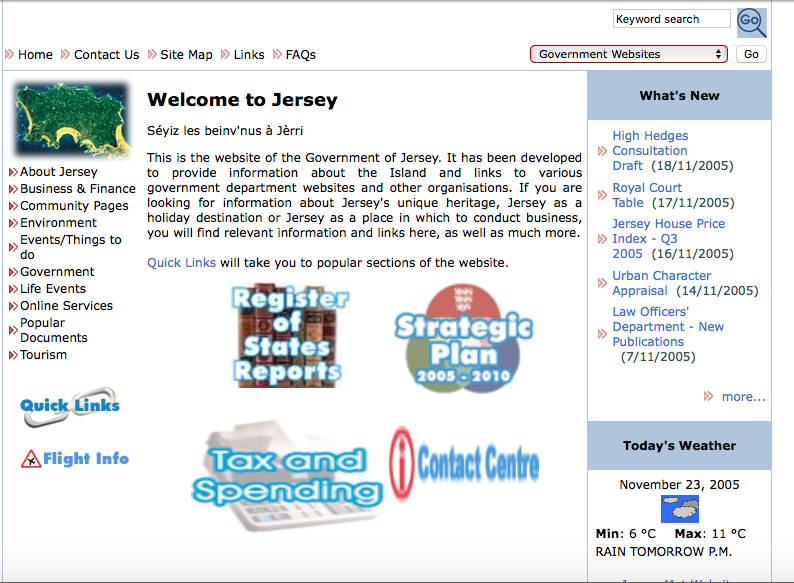 We simplified the layouts, made the search more prominent and brought back the weather, replacing the old jerseymet.gov.je site. 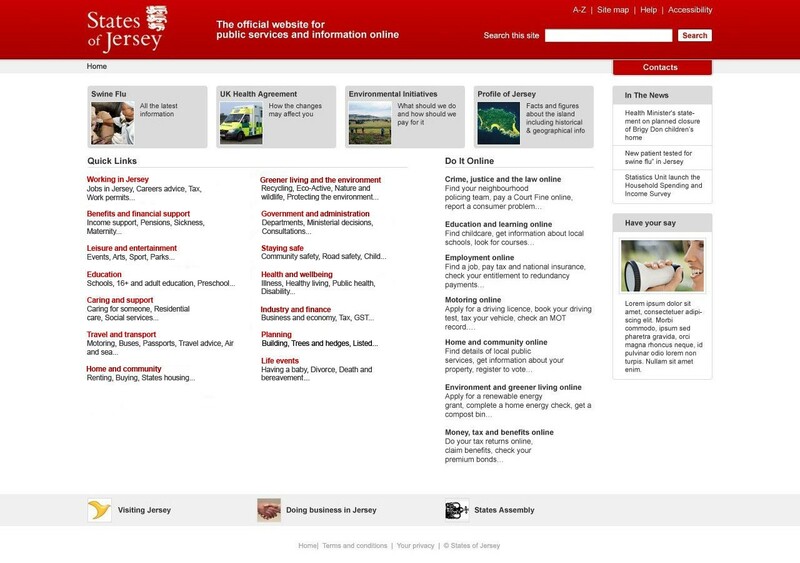 Since then www.gov.je/weather has consistently been our most used section. We worked closer with customers and learnt more about usability, user research and user experience. We took our testing out into the field, and we worked closely with the Digital Accessibility Centre to thoroughly test the site to make sure it worked well for everybody. We made a wide range of improvements based on feedback. And here we are today, receiving 2.7 million visits over the past 90 days, providing services across a range of devices and browsers. We’ve introduced a new template for campaigns which we used for the first time for our Fostering and Adoption campaign in May. 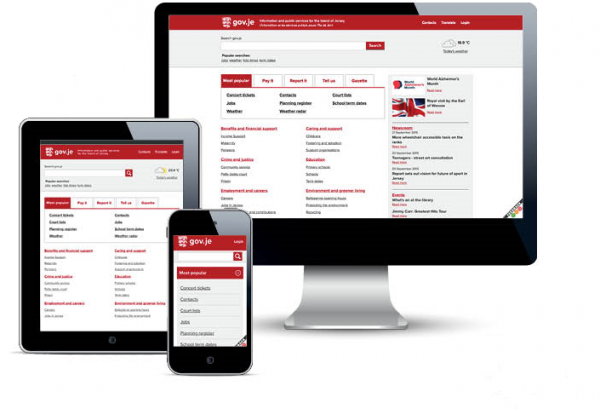 We are currently developing a new layout for our departmental pages. Our reports and documents are getting a make-over too which will give increased functionality and make it easier to find reports. We work hard to continuously improve the website, and not all those changes are easily seen. The core Digital Delivery team has seven employees, responsible for ensuring that the information on States websites is easy to find, easy to read, accurate and up-to-date. Across departments there are a further 45 content managers and editors who, as part of their jobs, work on the 18,000 pages. Two further people are focussed on creating online forms, with several trainees due to be recruited by the forms team this summer to increase the pace of building online services. To date over 250 staff have received training on ‘writing for your customer’. Well done all of you, and thank you! The Digital Delivery Team is available by phone and email, or use the social media links below to get in touch.